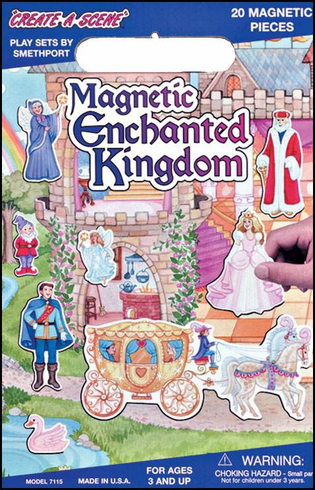 The concept is the same as Colorforms--a bright background scene with moveable characters--but here the background is magnetized, and the character pieces are made from heavy vinyl. The set is boldly illustrated with various fairytale characters: a princess, a fairy godmother, a handsome prince, a king, a dragon, a dwarf, and, inexplicably, something that looks a lot like a Tasmanian devil. The scene is swathed in lots of cheerful pink.